﻿I mentioned last Thursday in a Facebook post that I was being “forced” (by my own choice) outside of my comfort zone. Way outside. I didn’t have time to get into details or post a full blog about it then, but basically I said I was taking my own advice and choosing to LIVE, fully, despite the fears. Let me tell you what happend. My overworked husband and I had planned a long weekend trip to go camping and boating with some friends. Our destination: about 7 hours north of where we live, near where we used to live. A 7 hour tow with our Suburban (over 200k miles on it) and our 21′ jet boat, over the steep hills and curves of I5 in Southern Oregon, north through Eugene and then traffic heavy Portland, and then up into the foothills of Mt. Saint Helens to Lake Merwin, is a long tow. Our plan was for hubby to work in town that day (he covers a HUGE area of Southern Oregon) and hopefully get on the road a bit early from home. That was the plan. And then the pager went of. Beep Beep Beep Beep Beep Beep! My hubby is on call 24/7. When the Beep Beep goes off hubby has go to go. He had worked the 5 previous weekends straight. This was to be his one off call weekend over a span of 9 weeks. Yah, he is overworked. Hubby had to go north, to Roseburg, Oregon…about 2 hours north of here. That left me at home and hubby 2 hours away. So where does the fear facing, walking the talk, LIVING life part come in?? I hauled our boat up I5 for over 100 miles, through the twisty hills, by myself. I have towed the boat around a bit here and there, at the boat docks when we pull out of the water, mostly. I have also hauled a car trailer around a bit, here and there. 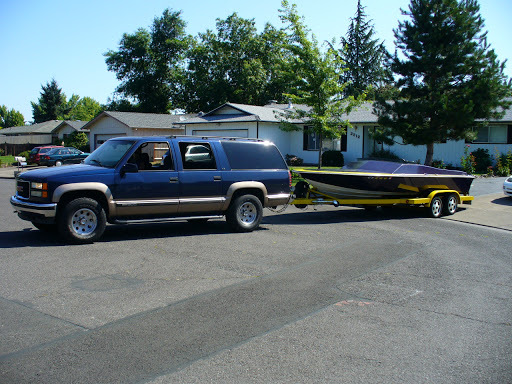 But I have never hauled our boat trailer up the freeway for over 100 miles totally alone. It was SCARY to contemplate BUT it was amazingly empowering to accomplish! Luckily I had no problems. I saved my poor hubby from having to drive 2 hours north, work all day, drive 2 hours back home just to get in the ‘burb and drive those same 2 hours all over again, plus 5 more! It was exhilirating. Empowering. Amazing. THEN, while we were camping, not only did I pull the boat out of the water, but I also BACKED it up into our campsite! I also drove the boat some this weekend on the lake, which is normal, but I keep practicing pulling up to the dock, and this time, up along side of our friends boat so we could raft up. I used to be massively nervous about driving I5 in S. Oregon due to the series of very steep hills and tight corners. I now have done it so often that even though I was hauling the boat, I had no fears about the road itself. Also, I used to get very nervous if I had to drive my husbands truck because it has a canopy on the back that you cannot see out of at all. Again, I have done it enough now that it didn’t even create a second thought in my mind. It is incredible to me how many of our fears can be overcome just by the doing, the living, the being, the actively participating in our lives. There are fears I have never overcome, even though I have been exposed to them time and time and time again, so I don’t believe that exposure to a fear ALWAYS breeds comfort, but it is empowering to know that it is *possible*. It is possible that what you fear today will become completely insignificant tomorrow, if you focus on living your life and facing your fears. My weekend was an amazing, and ongoing, lesson on how living my life really does impact my outlook on life. There were many lessons; many examples of times when I could have chosen to live or to wilt like a wall-flower. This entry was posted on August 30, 2011 by Corrie Beebe in action, anxiety, fear, lessons.